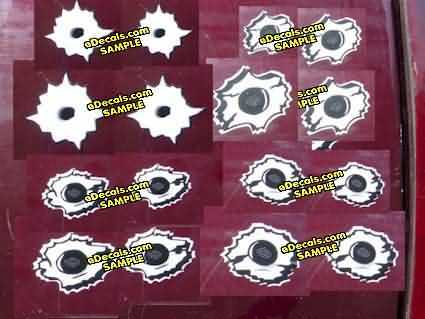 These simulated bullet hole decals are printed on self adhesive vinyl material. They can be installed on windows, painted surfaces or any place you wanna stick a hole! The sizes and costs are listed for each specific product. The Ultimate Combo Packs include all the styles shown above. As with all of our products, there are no returns or exchanges if you select the wrong size for your application.